Yes, you read right: we have 5 pairs of tickets to give away for Maker Faire Bay Area for this weekend, May 19th and 20th, 2012! Leave a comment in today's post that is something about making something (surprise us)! Head over to the Craftside Facebook page and leave a comment on our Wall. Subscribe to our e-newsletter (on the top-right corner of the blog). Enter by Midnight ET on Wednesday, May 16th. We will select winners at random and will send e-mails to the winners on Thursday morning, so check your e-mail! You will need to respond to the e-mail by 5 PM ET. You will be asked for your name and the tickets will be held at the "will call" entrance at Maker Faire. Good luck to all and be sure to come by the Craftside booth #220 and say hi!!!! Learn how to make a recycled leather and plastic Steampunk gear cuff. See how to make a tattoo-style card! Play along with the current Make-It-Over craft challenge! Submit your shrink plastic crafts or links! A Styrofoam head must be made into an auction-worthy art piece... Carmi's results are now online. Enter the "Mom & Me Knits" Contest to win a $50 gift card plus an assortment of knitting books. Tammy is catching up on listening to podcasts and explains why she decided not to start one herself, even though she'd like to see more craft related ones available. 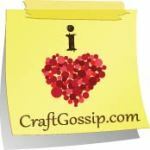 The Artful Crafter shares free clip art sources to publicize neighborhood fun. Cyndi got to film a master glass worker on the Italian island of Murano! Surprise! I have a very special post to share with you today. Last weekend was Maker Faire New York. I didn't make the cross country journey but 2 of my fellow "Craft Scouts" did, Cathy and Lindsey, and today's post and all the cool photos she took is brought to you by Lindsey. Thanks Lindsey for sharing! As a first-timer to Maker Faire, I can honestly say I was blown away by the sheer amount of creativity, ingenuity, and energy of the whole event. We at Craftside were beyond impressed with the amazing creations surrounding us at the New York Hall of Science, including an MIDI-controlled musical robot that left us both enthralled and just a little bit deaf! There was also a wide array of fun transportation hitting the pavement, such as this pink fish bicycle (fishcycle?!) that brightened up the streets. Here, a couple young crafters get cozy in our smiley-face chair. Our Amineko kids also came along – here they are perched atop Esme, our lovely mannequin. I want to tell you about two fabulous events coming up that you can meet Team Craftside (comprised of those of us who are committed to spreading the crafty word and the authors that write amazing books)! Sarah Ahearn Bellemare will be there signing Painted Pages: New Ways of Fueling Creativity with Sketchbooks and Mixed Media. There will also be signed copies of Misty Mawn's Unfurling, A Mixed-Media Workshop with Misty Mawn: Inspiration and Techniques for Self-Expression through Art for sale. Lots of other books too! All the books will be 25% off! Come by our booth and get yourself a free MakeReady Journal! These are blank journals made out of the recycled print run ends when the printer is setting up to print the books. These ones are made from when Unfurling was printed! We will also be hosting a free Make and Take - come by and make a measuring tape and button bracelet! Can't make it to NYC and still want to see how to make a measuring tape and button bracelet? Pop on over to this Craftside how-to post. Maker Faire Bay Area 2011 was A-mazing!!!! I would have to say the highlight in the Craftside booth was this adorable Steampunk girl who was sporting a beautiful top hat that was embellished with an amigurumi octopus that she knit using the pattern from Amigurumi Knits: Patterns for 20 Cute Mini Knits. It is always so fun to see projects people make live and in-person! Thanks to all who came by the Craftside booth; it was great crafting and chatting with you all! Amigurumi is the Japanese art of knitting or crocheting small stuffed animals and anthropomorphic creatures. Typically they are kooky little animals but they can also be inanimate objects, like vegetables, that are given faces and limbs. Amigurumi Knits has 20 designs, including animals and inanimate objects. A knitting basics section provides instructions for all the techniques needed to make the projects. Hansi Singh (Seattle, WA) began designing knit amigurumi creatures as playmates for her infant son. Hansigurumi, a shop she opened on Etsy for selling her amigurumi patterns, caught the attention (and needles!) of knitters in the US and abroad, and became an overnight success. Hailed “an amazing up and coming crafter” by CRAFT magazine. Cyndi starts a series of experiments with soy silk roving. See how to make a two-headed girl in a cage photo op. Yup! It's almost here! Maker Faire Bay Area 2011: May 21st & 22nd, 2011. And Craftside will be there too! We will have a booth #258 in Expo Hall filled with the hottest new books on all sorts of amazing creative topics, as well as a most fabulous free Dritz tape measure bracelet make and take (see how to make one below). You can also hook up some crochet kitten mittens with us, modeled by our illustrious Amineko pack! We will have many more freebies and fun! So come and sit in our smiley face inflatables and get your craft on with us. 2 Sets of Tickets Giveaway!!!!!!! We have 2 sets of tickets to Maker Faire that you, our fabulous Craftside readers, can get yourself in the running for just by leaving a comment in today's post by Midnight Wednesday May 18th, 2011. The winner will be chosen Thursday - be sure to check your e-mail! The 2 winners will then get the tickets e-mailed to them. So if you are going to be in the Bay Area on the 21st or 22nd of this month and want something absolutely fabulous to do, this is the thing! Now, onto the tutorial on how to make measuring tape bracelets. The reason why this post is titled "part 2" is I posted a while back a version of these bracelets I made with metal tape measures. We all loved them so much we wanted to share them with all the great people at Maker Faire but the metal ones involve sparks flying and drill presses etc. so we opted for a kinder, gentler version that involves safer materials and tools but still rocks! We used both the 3/4 inch wide quilt yellow tape measures and the 1/2 inch white ones from Dritz. To make the tape measure bracelets, first cut a section that will fit around your wrist with about a 1 inch overlap. Then, based on the button you are using, punch 2 or 4 holes through both overlapped ends of the tape measure where the button holes are. Then, with a length of 24 gauge wire, "stitch" the button to the tape measure. I liked using the "x" pattern but you could use any you like. Then I simply twisted the ends of the wire together and trimmed the ends. Here is my collection of white tape measure bracelets. I love both sets so much. I hope you'll come by and make one with use at Maker Faire.